Formerly attributed to the Dutch artist Nicolaes Verkolje (1673-1746), it has been suggested that this painting may be English. 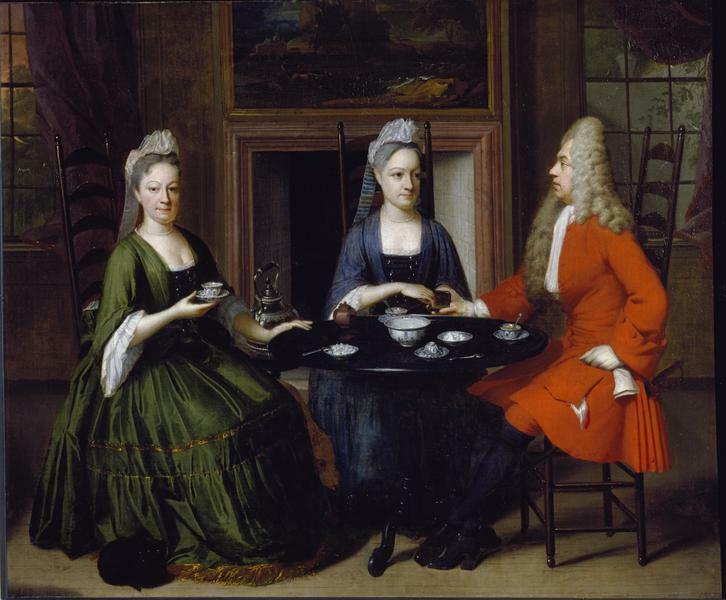 The costumes of the three characters suggest a date of around 1715 and an English origin. This type of intimate interior scene became especially popular in England during the early 18th century and represents an early example of this fashion drawing upon Dutch genre painting of the preceding century. 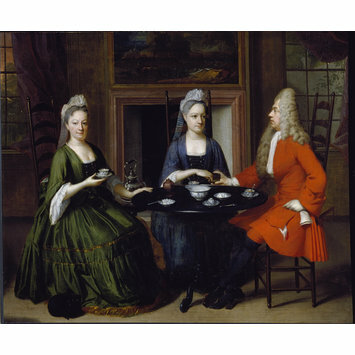 Two ladies - one dressed in dark green, the other in a dark blue/grey - and a gentleman in a red jacket take tea around a circular table whilst seated in ladder back chairs. In the background is a fireplace with a painted overmantle. Acquired as a work by Hermann Van der Mijh, this painting was exhibited under the name of Nicholas Verkolje (A. Staring for the Rijksmuseum Museum, Amsterdam, 1952). The catalogue retained the latter attribution to Verkolje for a long time until Dr Fred Meijer (RKD, The Hague - written communication, April 2012) assessed that this painting was not by this artist and not even possibly Dutch or Flemish. A study of the furniture and costumes may suggest that the painting was in fact executed by an English artist. The difficulty in identifying the artist stands in the fact that the main features of the painting: furniture, costumes, vessel ware are not characteristic of any country but were wide spread in northern Europe during the early 18th century. The tall turned black chairs were found throughout Europe (there is a set in Boughton House for instance) while the ebonised round table could be of English origins as well as the kettle. As for the blue and white China, they were highly appreciated in Holland and England, and were made directly in Asia for the European market. The dresses with mantuas and matching petticoats correspond to the English fashion of c. 1710-20. The officer’s red suit with a large lace frill was a fashionable style of male clothing by the period 1700-1705 (a similar suit is in the V&A collection: see T.327-1982). The officer’s full-bottomed wig and the women caps retain the height that went out of fashion after 1720. 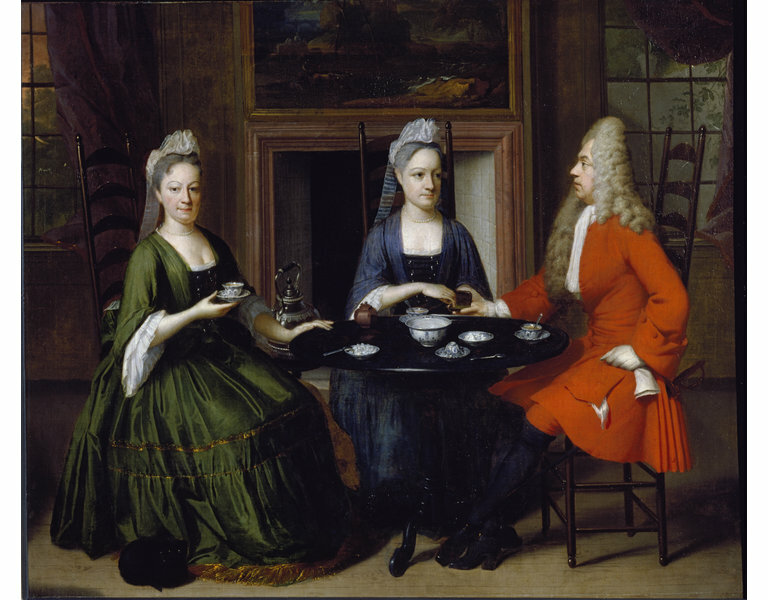 This type of intimate scene drawing from 17th-century Netherlandish interior scenes became especially popular in 18th-century England in contrast to the Grand manner portraiture; and the tea party was one of the most popular subjects for these scenes called ‘conversation pieces’. Such painters as William Hogarth (see A Family Party, 1735), but also Gawen Hamilton, and Charles Philips made their reputation on conversation pieces. The donor, Charles D. Rotch, assembled quite a large collection of paintings and furniture, which also include a number of ceramics and silverware. It is not unlikely that he acquired this painting because it was featuring some pieces of furniture, silverware and blue and white china similar to the ones he owned. Kauffmann, C.M. Catalogue of Foreign Paintings, I. Before 1800, London: Victoria and Albert Museum, 1973, p. 295, cat. no. 367. Fock, Willemijn ed., Het Nederlandse interieur in beeld 1600-1900, Zwolle, 2001, p. 217, fig. 168. Connoisseur, lxxxii (1928), p. 223, repr. only. R. Edwards, Early conversation pictures, 1954, pp. 43, 147, no. 42, repr. (as Verkolje). Taste and Essence, Macau : Museu de Arte, 2013. ISBN: 9789996502040.